This week for CooktheBookFridays we chose a vibrant, colorful and delicious raw vegetable salad. Mine was full of red and white cabbage, beets, carrots, apples, and kale, along with parsley, chives, and a hard cooked egg. The beautiful color of this salad fit my mood…colorful, bright and celebratory! Not only was it simple to make, but it was also quite flavorful. I loved the way it presented on the table. The dressing was a perfect pairing for this salad. We loved the creamy flavor it added. Excellent as a side with grilled chicken or fish. Slaw is a favorite salad in our house, and I just found a new variation. A winner for sure! Now on to my celebration. We have been very blessed this year for a lot of reasons. Recently my son surprised us with his engagement. They got engaged in Cinque Terre, Italy. I know, so romantic! I hosted both he and his lovely fiancee here two weekends ago, along with other family members. Toasting to a long and happy life together. Then last week, we went to Long Island for a visit with my daughter, son-in-law, and grandchildren to have another celebratory visit. More champagne! Delicious food and getting to know one another. We were thrilled to meet and welcome our son's charming, and delightful fiancee into our family. La Vita è Bella! Cook the Book Fridays is a group cooking through David Lebovitz's cookbook, "My Paris Kitchen". If you would like to cook along with our group get yourself a copy of the book and join us. Check out what the other bloggers thought of this salad here. This week's salad has been shared online, so I am sharing it here with you. Whisk together, cover and refrigerate for several hours. Toss slaw ingredients together in a large bowl. Toss with the dressing. Congratulations and what a beautiful couple! The slaw looks crunchy and tasty. Congratulations to your son! Aren'the celebrations so much fun?! change all around. Enjoy the 4th of July holiday. What a sweet engagement photo. Congratulations! The veggie slaw looks tasty, too. I always like more veggies in my slaw than the standard cabbage mix. Your salads look bright and cheerful, so fitting for the family celebrations all around. Congratulations to the lovely couple. Happy 4th of July! Your slaw looks fantastic - so vibrant and perfect for summer. Congratulations to your son and his fiancee. Congrats to your son! Your slaw is so pretty! Congratulations! That slaw looks beautiful and celebratory. Have a wonderful long weekend! What a pretty slaw, Kathy! This will be a summer favorite. Congratulations to Dennis and Jamie! Very exciting! Happy 4th of July! Congratulations for all the good things in your life, Kathy! What fun times! The salad looks gorgeous and I agree that it's going to be added to the arsenal of salad possibilities. I really love the "whatever veggies you have available" style of the recipe that makes it an easy one to choose. :) Happy 4th of July! Congratulations to your son, Kathy! Such fun news! 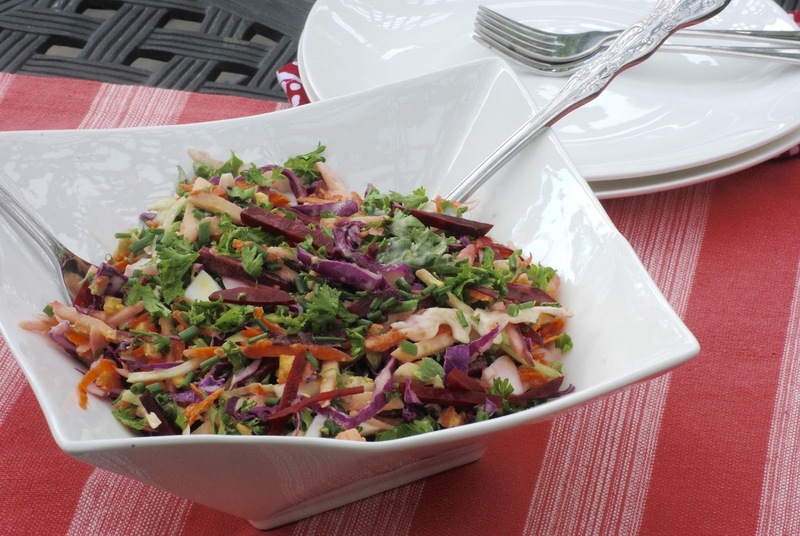 And this slaw looks wonderful--a yummy summer staple! Your slaw is very bright!! I love all the greens you added. Congratulations on the engagement. Wow this really packs in the veggies! I'll have to keep this in mind when the CSA gets ahead of me! Congratulations and good wishes to the young couple. Love the given list of vegetables to choose from to make the slaw to go with the delicious dressing. Congratulations are in order, they look very happy. Loving all the summer slaws I have been seeing, yours looks delicious!!! Enjoy these wonderful moments, Kathy. Making memories. But, you are. Congratulations to your son and his lovely new lady. Don't you love it when our kids find the perfect partner? I think we all really enjoyed this raw slaw. I also used the dressing for dip which had a bit more of a tang and zip than my boring hummus (not that there's anything wrong with hummus). I hope the rest of your summer is just as wonderful. What a gorgeous slaw! So colorful and bright! Also, many congratulations on your son's engagement! How exciting!